Any structure that is built with steel requires drafters and detailers, with their work being heavily relied upon for not simply the look and function of the structure but also the way in which the steel is fabricated and installed. We are going to look here not only at what steel drafting and detailing actually is, but also how it fits in with fabrication. What do steel detailers and drafters do? The main role that is carried out by the steel drafters and detailers of a project is that of consulting the architectural and engineering drawings related to the project before interpreting what they mean and creating their own drawings based on the steel components that are required for the structure. It’s vital that these drawings are completely accurate, the whole project depends on them as they detail the location along with specifications of all steel components in the structure being built. The role of steel detailing is to produce the shop drawings that will later be used by the people fabricating the steel for use in the project. 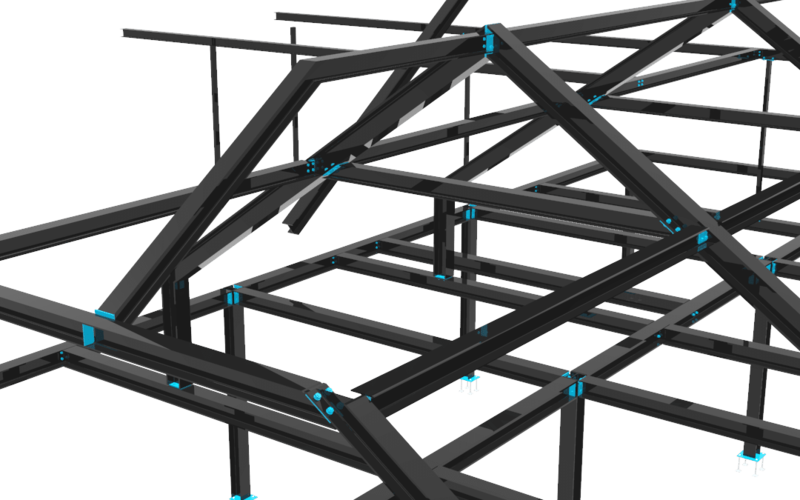 It’s important that these drawings reflect accurate specifications for the fabrication of every steel component, which could include beams, braces and joists. These shops drawings will sometimes include material and surface specs as well as details related to welding and painting. Erection drawings will also be created to benefit those who are erecting or installing the fabricated steel components. They’ll include details such as the exact location where components will be installed and instructions for how they should be installed. As with the previous drawings, it’s crucial that these are accurate to ensure the smooth running of the entire project. Further to the drawings above, an important part of the role drafters and detailers serve is to create a BoM (Bill of Materials). A BoM is a record of all materials, supplies and sub-assemblies needed for constructing all of the required steel components. This BoM will help maximise efficiency for the project by making it much easier to monitor the amount of materials required (which gives an indication of overall cost). A BoM will sometimes include estimations of the amount of scrap that can be expected which can again maximise the overall efficiency. Steel drafters and detailers will be used to create drawings completely by hand, however, it’s now much more common for CAD (Computer Aided Design) technology to be used in this process – allowing for a quicker and easier process when generating all of the necessary drawings for the project. In recent years CAD software has revolutionised the jobs of detailers and drafters and has enabled more accurate, 3D drawings to be made for everything. These accurate and 3D drawings allow for the visualisation of the components being used and the deepened understanding of their role in the structure as a whole. Steel drafters and detailers play very important roles in their projects. Ultimately it’s their job to ensure everything is in place for accurate fabrications to be made and it’s vital that they’re qualified to do their job and are aware of the appropriate standards that need adhering too. A mistake at the drafting/detailing level can lead to mistakes further down the line and it’s important to note that these mistakes could prove fatal in a worst-case scenario. If not fatal then they’ll be costly to rectify at the very least. If you’re looking for professional fabrication drawings by qualified steel detailers and drafters the get in touch on 01462 514 300. Alternatively, you can email [email protected] and we will endeavor to respond as soon as possible.